Middle-Aged Southern Women with guest, Haley Armstrong. Back when I was a level 1 student – I don’t remember exactly when that was; probably the 80s – our teachers espoused us to watch STAN shows, and with good reason. They are a DCH institution like few other troupes can boast to be, and their shows are “part play, part movie, all fun,” replete with an “improvised soundtrack.” It’s made up of Anthony Bowling, Nick Scott, Shawn Frambach, Tabitha Parker, & Timmy Mayse, and scored by Raye Maddox . 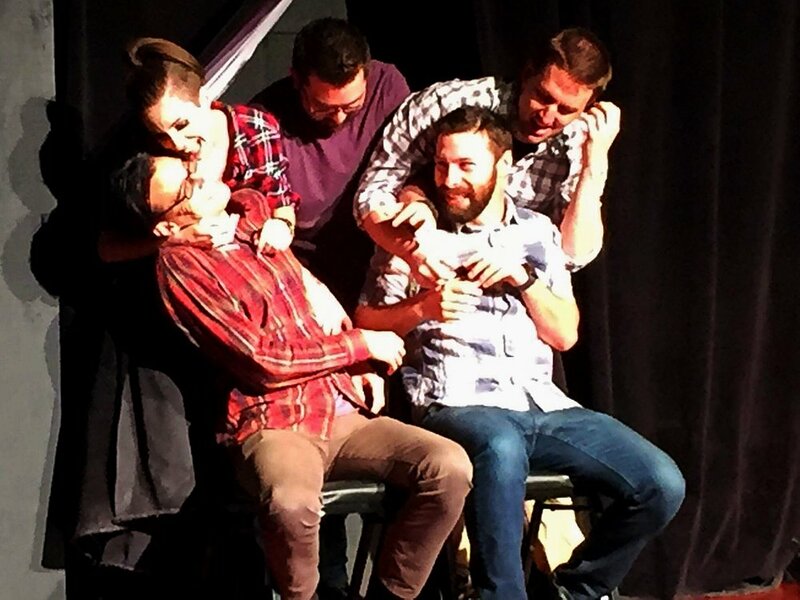 They have a lot of knowledge to share too, and so even experienced improvisers like Kent Wicklander and Houston Hardaway stand to benefit from their knowledge – especially when they are forming a new troupe. That new troupe is Middle-Aged Southern Women, where Kent and Houston perform a “stream of consciousness monoscene and drink tea as middle-aged southern women.” The guest, in the case of the picture, is Haley Armstrong. Here are Middle-Aged Southern Women’s questions! Here are STAN’s answers! STAN loving each other on stage. MIDDLE-AGED SOUTHERN WOMEN: Whats the best piece of criticism you ever received in regards to performing? Tabitha Parker: Get out of your own way. Timothy Mayse: I’d say the best criticism was never over reward yourself after a great show and don’t over analyze a bad show. Learn from both regardless of how it goes. Nick Scott: One time I made a move in practice that was directly in line with the game. Afterward, our coach wanted to know why I made the move. I started explaining how it was a clear 2nd beat based on the first scene, when he stopped me and said "Yes, I understand the logic, but it wasn't, well, funny. Or interesting. Or good." I've probably thought about that criticism more than any other note I've ever gotten. MASW: What's the dumbest thing you've said on stage and how did you justify it in the scene? NS: This question doesn't apply to me because everything I've ever said is genius (please ignore any answers to these qestions that imply otherwise). Shawn Frambach: To be honest, I try not to do a lot of things that need to be justified. I try to serve the scene and give it whatever it needs. Most of my actions are born out of a character and I don't judge those in the sense of needing to justify them. I let them kind of do whatever since hopefully they are so invested in the narrative that it is just a part of the story. That being said, I make mistakes all the time and having a great team that is very experienced at justifying things I do all the time. They're really good at also handling the dumb stuff I say and incorporating it so it doesn't necessarily need to be justified. MASW: What piece of media do you think has influenced you the most? Anthony Bowling: When it comes to influential media I always turn to comedy movies. I’m a big fan of the Marx brothers, 80’s comedies (anything with Bill Murray, Chevy Chase, anything Harold Ramis or Mel Brooks directed). These had larger-than-life characters that were able to function in a somewhat sane world and come out on top. I bring a lot of those traits to my characters in STAN. NS: Comedically? Probably The Simpsons. Overall? Star Wars. In terms of trying and working hard to make my dreams come true and the lasting value of friendship and working together? Cool Runnings. In terms of what's its like to be a lady working in male-dominated businesses? Either 9 to 5 or Working Girl. Raye Maddox: Music and loud noises. MASW: How do you keep a balance with your characters between ridiculous and grounded? AB: I keep my characters balanced between grounded and ridiculous by making sure that even the most ridiculous character I play believes they are the most normal and justified in their beliefs. TM: I love to give my characters a flaw, could be something big or small. It’s up to you and don’t be afraid to show the audience what that flaw might be. No matter if the character is high or low status. NS: Even when someone wants or believes something ridiculous, it's not ridiculous to them, and they have real emotions attached to it. So I try to keep that in mind. SF: To be honest, I think I touched on this with the last question but I think it's in making them relatable. They are people with emotions and feelings no matter how stupid or crazy they are and you can't forget that. I love nothing more than making a stupid/absurd character at some point in the show, the voice of reason. Characters aren't just one thing throughout the whole show; waver. MASW: What are some things you've found are helpful to keeping a character fresh while playing them through a narrative? TP: I don't think I try to keep the character fresh per se, since we are doing a narrative I try to stay true to them and what they wanted in the beginning. You discover things as you go but the goal for me is always for them to serve the piece. NS: I keep my characters in the freezer and don't open them until right before I step on stage. MASW: What movie franchise would you want to see Rick Moranis reboot? SF: To be honest, The Secret Life of Walter Mitty. NS: What movie franchise would I not want to see Rick Moranis reboot? TP: If he's rebooting a franchise does that mean he's the producer? If yes then my answer is the Fast and the Furious. You can watch STAN every Wednesday at 8P. Catch Middle-Aged Southern Women next on Friday, March 23rd at 10:30P. Kevin Beane graduated from the DCH improv program in 2016 and is in the DCH troupes Preschool Fight Club and Dirty Dawg$, as well as Dallas-area troupe Autocomplete. He likes sports, eating, sleeping, board games, poker, euchre, and procrastinating. He hails from Akron, Ohio. You can also read him in TheatherJones.com, where he is the DFW comedy beat writer.